Cabatuan, Iloilo, Philippines “We want to express our condolences to the government and the people of the Philippines, particularly the family members of those who have been affected by this tragedy. And I want to also confirm what the President said, which is that we have made a donation for the victims to the Philippine Red Cross and equally, or perhaps more important, the United States Navy is also sending a vessel to the scene of the accident, and we hope it should be there in a matter of hours." WASHINGTON, D.C. -- President Gloria Macapagal-Arroyo personally thanked today the United States government for the support it is extending to the victims of typhoon Frank. 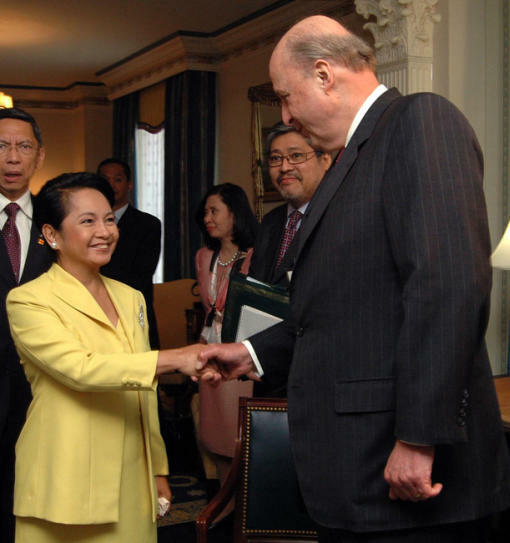 The President expressed the Philippines’ gratitude during her meeting with US State Department Deputy Secretary John Negroponte at the Willard Hotel here. ''We are deeply grateful for the help by the US government...'' the President said. The US pledged to send P4 million (or roughly $100,000) worth of emergency relief goods through the Philippine National Red Cross (PNRC). The US Navy Ship Stockton, with rescue helicopters on board, is now on its way to Sibuyan Island off Romblon to help in the rescue and recovery of the passengers of sunken MV Princess of the Stars. The US Navy P-3 maritime aircraft was also ordered to help in the search for survivors. ''We want to express our condolences to the government of the Philippines and the people, particularly those who have been affected by the tragedy,'' Negroponte said. ''Our hearts go out to the government and people of the Philippines, particularly the victims of this terrible tragedy which has just occurred,'' he added. Typhoon Frank left hundreds of dead and missing with an estimated P1.45 billion in damages. US Ambassador to the Philippines Kristie Kenney, who is also here for the President's visit to the US capital city, echoed Negroponte's statement that President Bush would convey the US government's condolences when the two leaders meet tomorrow at the Oval Office. 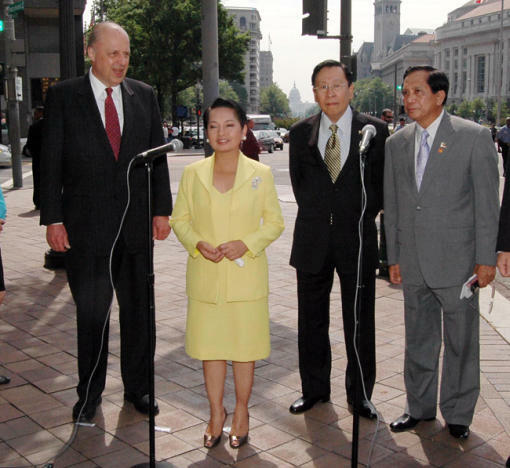 Washington, DC (June 24, via PLDT) -- President Gloria Macapagal-Arroyo arrived here shortly before midnight Sunday (Washington time) on the second leg of her ten-day working visit to the United States. The President planed in by special flight from Fresno, California and was welcomed at the Dulles National Airport by officials and staff of the Philippine embassy in Washington led by Philippine Ambassador to the United States Willy C. Gaa. Immediately upon arrival at the Willard Hotel, the President convened a meeting of members of the Cabinet accompanying her in her US trip to assess the progress of the relief and rescue operations in the wake of the devastation wrought by "Typhoon" Frank in several provinces in the Philippines. Of special concern to the President, Philippine officials said, is the fate of the passengers still trapped inside the hold of the MV Princess of Stars ferry, which sank off Sibuyan Island at the height of the typhoon Saturday. The President begins this morning (Monday, Washington time) her first round of meetings in the US capital when she confers with Deputy State Secretary John Negroponte at the Willard Hotel's presidential receiving room. Philippine officials were mum on the agenda of the meeting between the President and the No. 2 US state department official, but the discussions were expected to cover a wide range of issues on US-Philippine bilateral relations. 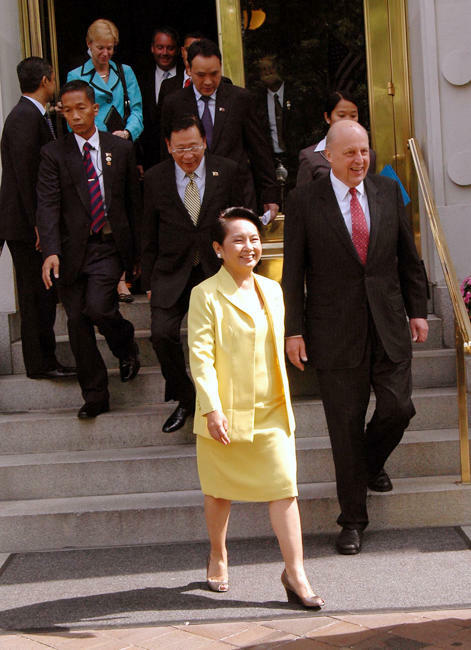 Negroponte -- who served as US ambassador to the Philippines in 1983-89 -- coordinates and supervises US government activities overseas, represents the state department's position before Congress, and manages key foreign policy issues on behalf of the secretary of state. Also today, the President will meet with officials of the Millennium Challenge Corporation (MCC) to firm up the Philippines' bid for MCC Compact status which would pave the way for increased US funding assistance for the country's anti-poverty programs. The MCC is a US government corporation created by President Bush at the turn of the millennium to "regard the countries that govern well" by way of US assistance for anti-poverty and sustainable development programs. The Philippines has already received $9.4 million in assistance from the Millennium Challenge Account Threshold Program (MCATP) for its Run After Tax Evaders (RATE) program; $3.1 million for the Run After The Smugglers (RATS) program; and $1.4 million for the Revenue Protection Service (RIPS) program. The MCATP also funded Philippine government programs designed to reduce corruption by strengthening the capability of the Office of the Ombudsman to prosecute corrupt officials. San Fernando City, La Union (25 June) -- President Gloria Macapagal_Arroyo, still in US is doing every way she can to keep everything under control amid the tragic experience brought about by typhoon "Frank" and at the same time personally expressed her gratitude for the US government's support to the Filipino people particularly to the victims and family of those affected by the sea mishap. 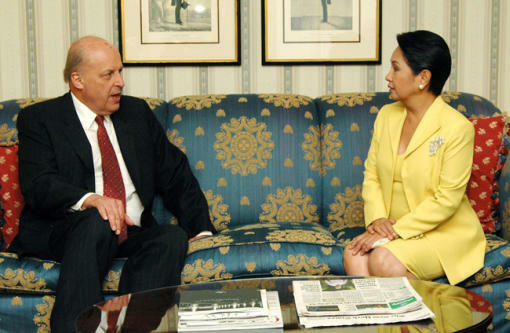 In a courtesy call with the President at the Willard Hotel in Washington, US State Department Deputy Secretary John Negroponte relayed the US government's condolences and said that they are saddened with the recent tragedy that the people of the Philippines and the government are experiencing. As President George W. Bush expressed his condolences, the US government sent P4 million (or roughly $100,000) worth of emergency relief goods coursed through the US embassy in Manila and forwarded to the Philippine National Red Cross (PNRC). They have also sent HH-60 Pave Hawk rescue helicopters on board a US Navy Ship Stockton to Sibuyan Island off Romblon as well as the US Navy P-3 maritime aircraft to assist in the ongoing search and rescue operations in search for more survivors from the ill-fated MV Princess of the Stars. Manila (25 June) -- Personal na pinasalamatan ni Pangulong Gloria Macapagal Arroyo ang pamahalaan ng Estados Unidos dahil sa suportang ipinaabot nito sa mga naging biktima ng bagyong Frank na sumalanta sa Pilipinas. Ipinaabot ng Pangulo ang kanyang pasasalamat ng makipagpulong ito kay US State Department Deputy Secretary John Negroponte kung saan nagpaabot ang US ng $100,000 o may kabuuang apat (4) na milyong piso sa Philippine National Red Cross upang magamit sa pagbibigay ng emergency relief goods. Maliban sa cash assistance, ipinadala din ng pamahalaan ng US ang US Navy Ship Stockton at mga helicopter upang tumulong sa isinasagawang search at rescue operation sa mga di pa natatagpuang pasahero ng lumubog na Sulpicio Lines M/V Princess of the Stars sa Sibuyan Island. Manila (25 June) -- Personal nga gipasalamatan ni Presidente Gloria Macapagal-Arroyo ang kagamhanan sa Estados Unidos sa ilang tabang sa mga biktima sa Bagyong Frank. Ang pagpasalamat giduso sa Presidente sa iyang tigum ni US State Department Deputy Secretary John Negroponte. "Dako kaayo ang among pagpasalamat sa tabang nga gihatag sa kagamhanan sa Estados Unidos", si Presidente Arroyo nagkanayon. Ang Estados Unidos misa-ad nga mohatag og balor P3 milyones o $100,000 nga ayuda pina-agi sa Philippine National Red Cross (PNRC). Ang barko sa US Navy nga Stockton, nga adunay mga "rescue helicopters" padulong na usab sa Isla sa Sibuyan, Romblon aron pagtabang sa pagluwas ug pagpangita sa mga pasahero sa nalunod nga MV Princess of the Stars.